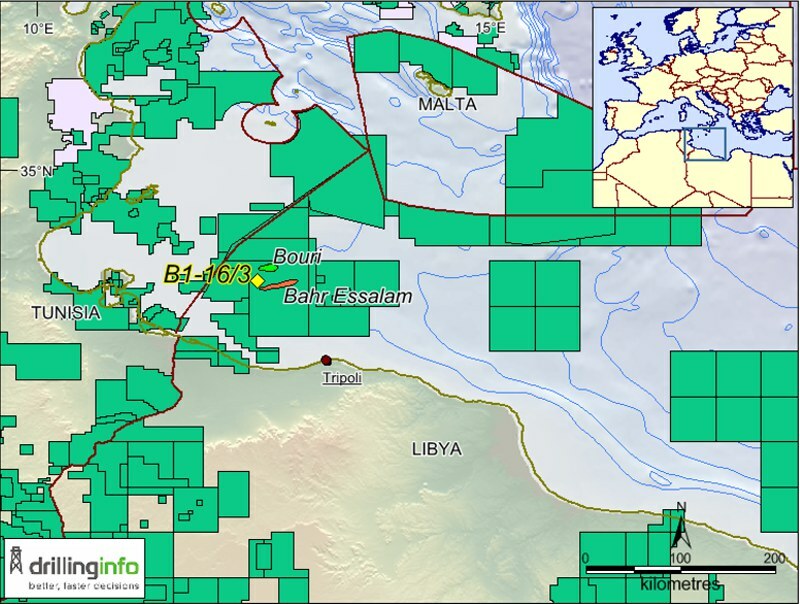 Eni has made a gas and condensate discovery with the B1-16/3 NFW Gamma prospect located on the offshore Area D concession, 50 km from the Tunisian border and about 140 km north-west of Tripoli. The well was spudded on 4 January 2017, utilising the ENSCO 5004 jack-up, and was drilled in 150m of water, reaching a TD of 2,981m in March 2017. B1-16/3 lies just 5 km north of the Bahr Essalam field and 15 km south-west of Eni’s well established Bouri field. The well targeted Eocene Metlaoui carbonates, which were successfully tested in two intervals. This is the first offshore discovery in the country since Eni’s A1-1/1 well in May 2015, which also encountered gas and condensate in Metlaoui carbonates. The company believes that the Gamma well could produce 7,000 boepd. The drilling of the Gamma prospect is part of Eni’s ‘near field’ exploration strategy, targeting opportunities that, if successful, can exploit existing infrastructures, thus reducing the time to market and providing additional gas to the local market and export. Eni operates the Area ‘D’ with 50% equity, in partnership with the NOC (50%, carried). With recent discoveries in East Africa dominating the news, the government of Tanzania is expected to get a lot of interest in its 4th Offshore Bid Round, due to be launched in September.